Today we’d like to introduce you to Delton Davis. One of the things I most enjoy is being a percussionist who specializes in playing and teaching the sounds of international cultures. Ironically, as a child I had no real concept of diversity. I grew up in a small southern town where there wasn’t much diversity of culture, race, or religion, or even perspectives. I was rarely exposed to people from other countries, their languages, customs, etc. It wasn’t until I was in college at the University of Tennessee, Martin, studying under Professor Nancy Mathesen, that I realized my idea of diversity was very limited, and my perception of others was based only on what I saw on T.V. I was surfing the Internet for drumming videos, and I remember being surprised and perplexed by a conga drummer’s dark complexion but Spanish last name. I was beginning to get a glimpse of just how wonderfully wide the spectrum of diversity is, and the intersection of music, language, culture, and ethnicity fascinated me. Fast forward to graduate school at California State University, Long Beach. I worked with Dr. Michael Carney and had the great opportunity to spend 3 weeks studying percussion in Brazil. While there, I met people of all shades and backgrounds, and I was blown away by the mosaic of Brazilian people. For example, I met a Korean-Brazilian, a German-Brazilian, and many other uniquely beautiful people. That was my first time being over seas in a South American Country, and all that I thought I knew was completely shattered. Internally I got upset that, until that point, my understanding of people and culture was severely limited to what I knew as a child and what I saw on television. This frustration spurred a passion in me to learn all I could about other cultures and languages, to seek out friendships and collaborate with people of many backgrounds, and ultimately to do all I can do ensure that every person I have the joy of teaching gets a view into the vast array of multiculturalism. I use drumming as the vehicle to provide that exposure. And, that’s how KidsDrumming came to be. I designed KidsDrumming with the goal of giving young children a fun, stimulating space to explore language and culture through the drum. Through KidsDrumming, children have the opportunity to form their own understanding of the world around them through the lens of international culture, rather than viewing the world only through a local lens. I must say that one of the benefits of living in California is that we have so much diversity around us. Yet I still find a need to broaden our perspective even more, and I love having the privilege of doing that for children in their early years of socializing and learning. At KidsDrumming we hope to have a life-long impact on children’s openness to and compassion toward others. And, we ultimately want to plant the seeds of excitement and intellectual curiosity– to inspire them to be adventurous, to explore, and to use the imagination to cross boundaries and open doors they never knew existed. All this positivity comes through the heartbeat of drumming! Being an entrepreneur, maintaining a healthy, balanced life is important to me. In gaining a perspective of my calling and purpose in life, I’ve learned to be grateful in the midst of any challenging times. I have a deep passion for what I’m doing, because I feel that the cause I’m striving for is much, much greater than me… and I feel grateful for the task I’m given. So I look at “obstacles” as learning opportunities, which makes the journey much easier to embrace. I believe some of the obstacles/learning opportunities I face are somewhat more internal vs. external. For instance, when presenting KidsDrumming, I am aware of some of the biases and stereotypes present in the room…and sometimes I feel hesitant to approach those specific cultures as I unfold the program to the kids. But, in those instances, I remember the purpose of KidsDrumming, I remember my past, and I am emboldened to stay the course and teach diversity through music and culture. Please tell us about Kids Drumming. 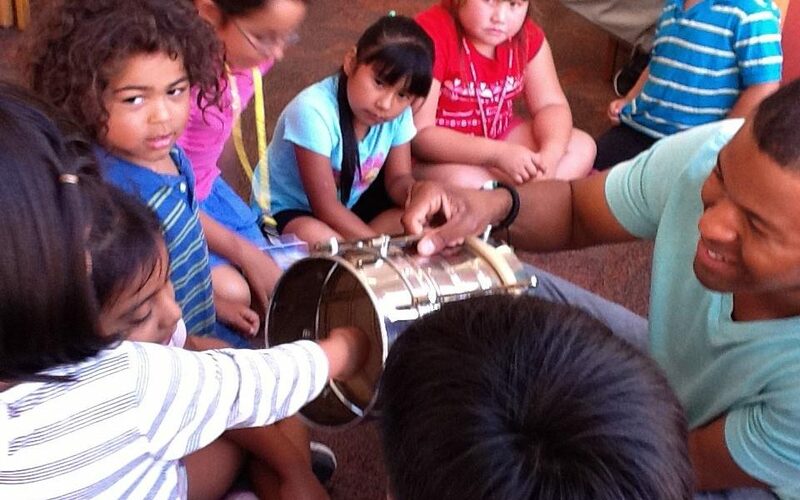 KidsDrumming is known for bringing language and culture to children at an age-appropriate level of understanding. We take participants on a “World Percussion Journey”. We bring our program to school assemblies, birthday parties, festivals, in-home and public childcare centers, and we offer group and private lessons. And, while KidsDrumming focuses on children, we also provide adult drumming experiences such as cooperate team building, drumming parties, as well as group and private lessons. I’m most proud when a parent comes to me and shares how his or her child is saying words in the language they learned at our events or class. I remember a parent telling me “You know my son keeps telling me that Brasilia is the capital of Brazil and the Pandeiro is from Brazil!” I am also grateful when I can simply play a rhythm on a drum and the kids chant words and phrases in various languages based on the rhythm I played. We cover a variety of languages such as Farsi, Portuguese, Arabic, Chinese and Japanese. I can see the pride students have in being introduced to new languages, and they bubble over with collective joy as they chant in unison. I believe I get a kick out of it more then they do, lol! A really great moment in time for me was when I brought KidsDrumming to the Philippines in 2015. I experienced first-hand how music is a universal language, and it truly brings humanity together. I spent two weeks going to various schools and working with the kids. On the last day, I was able to present a world percussion workshop for music educators. That was very inspiring and fulfilling. What sets Kids Drumming apart is that it’s more than just showing a child how to play a drum or even teach them a phrase in another language. It’s more of a movement to bring cultural awareness and acknowledge the inner value that we all possess. We not only teach drumming and language, but we also incorporate geography, history, math, cognitive skills, and motor skills. And we are continually expanding the curriculum. We also offer a line of mini cajons (the “box” drum) and paraphernalia. There’s more to come in the near future, including a series of children’s books, language acquisition tools, kids’ songs, and much more. We want our program to be on the trend of cutting-edge technology while continuing to use traditional methods of teaching and learning. Stay tuned for more! Growing up in the south, the marching band was a pretty big thing– especially the drummers. I was very fortunate to have awesome band directors James Henning, John Jones, Karen Henning and Mike Garnand give me a solid foundation in percussion. I was also inspired by an annual parade hosted by Lane College, an HBCU (Historically Black College/University) in my hometown. I remember looking forward to their homecoming parade every year just to see the bands that marched. My eyes were always locked on the drummers. At home, I would beat on pots and pans… and I recall that the ironing board produced a really great sound. The cool thing was that my mom never discouraged me, though she saw some of the furniture being torn by my drumsticks. Most of my family members were either in band or choir, so I grew up around a musical family; and, thoughts of my dad always playing his keyboard and having his friends come over to play music will forever be in my memory. Delton Davis is such an inspiring teacher. My son took lessons from Delton when he was in preschool and in Kindergarten. When my son entered Kindergarten at South Shores Performing Arts Elementary, Delton visited the school for special assembly days. He captivated the entire school all at once (500!) He is super knowledgeable & fun, high energy, and the kids love him! And when you hear him play…omg…he is a high level professional player! My son is eight years old now and is involved in Mixed Martial Arts, Dance, and Music. All of his teachers constantly comment on his impeccable rhythm and how fast he picks up on patterns. I just know without the foundation that Delton gave him he would not be as far along in his arts as he is right now. My husband and I are eternally grateful. It was my pleasure to bring Delton to our South Shores Magnet School for the Visual and Performing Arts in San Pedro. Ca. He was able to entertain, instruct and inspire over 500 students during a school assembly with his drumming, knowledge, and kindness. I’m so happy to see that he has been recognized by VoyageLA.